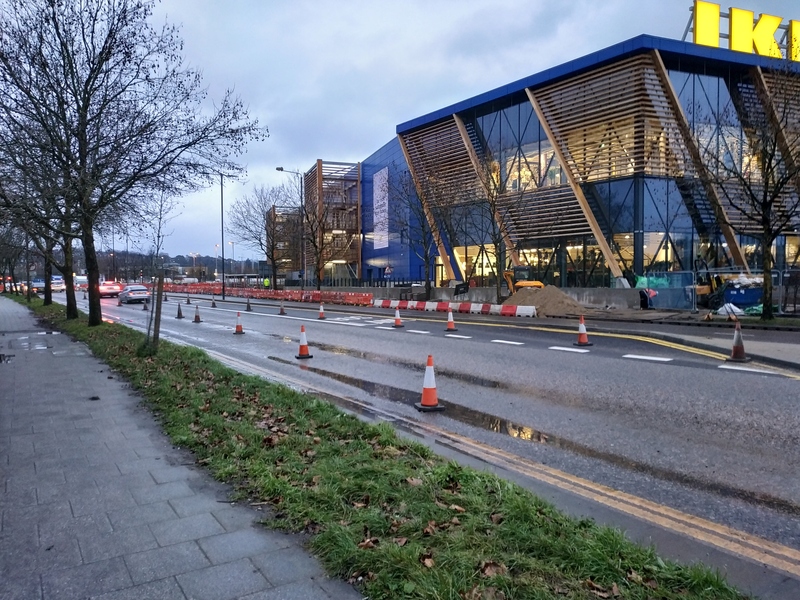 The first two days of the new Ikea in Greenwich saw no big dramas when it came to traffic though a bigger test will arrive this afternoon. Saturday afternoon shopper numbers in the area were high before the store opened and congestion pretty common. Today is the first Saturday open plus traffic arriving in the area for the Charlton-Southend game at the Valley. Around 12k fans can be expected. Charlton’s dire owner can be thanked for holding down attendances which will help the roads and public transport services. The days of 25k fans seems a long way off yet. Will many football fans try to park at Ikea? As recently covered, the car park is free for five hours without the need to make a purchase and they’ll even let you off the first time you overstay. Away fans will like that. One pleasing, though not entirely unexpected sight, (by me at least) has been many people walking or taking public transport to the new Ikea. Though the car park has often been full to capacity which could correspond to expected ratios of 30-40% public transport or foot and 60-70% car. In addition, many people seem to have only visited for the food (hour long queues in the restaurant have been seen) and a wander through the store making smaller purchases. Again, no surprise really as that’s common with Ikeas in cities and areas of high population density (i.e not Lakeside). Let’s hope poor quality walking links do not dissuade people from continue to make sustainable methods of reaching the store, nor bus cuts. One of the highest frequency routes passing the site had cuts confirmed this past week. The 486 will reduce from a bus every 7-8 minutes on Saturday daytime to every 12 minutes in less than two weeks. In other words, 8 buses an hour down to 5. So how have you found the store and reaching the site? Leave a comment below. It was a breeze getting there for me at 8pm. I’m surprised that a lot of people are only just realising it’s open (what planet they living on?) so once more established maybe visitors will increase. One downside is taking a bus home from work through the area and people with big bags trying to board alongside commuters. Tempers frayed. That will get worse with bus cuts soon. Which Bus reaches this IKEA SITE please ? I thought i’d pop down to the IKlding materials (no taxi will EA after 7.30pm thinking traffic would have died down, buy boy was I wrong. There was traffic and tempares flared with with some drivers! I managed to navigate around the notorious woolwich flyerover and make it to the car park and I had trouble finding a parking space, but did manage to find one. I don’t know if it’s just exceptionally busy because it’s a new store and that the congestion will ease up over time, but the signs are not good! Unfortunately B&Q customers are going to be majorly affected as they need to drive to transport bulky materials that many taxi companies will be unwilling to take. The bus stops were also packed with customers with large bags of purchases. I can image how much of a nuisance and trouble it’s going to cause commuters! Apologies for the non-sensical first sentance! My laptop keyboard must have gone mental! Traffic was queuing to get off the A102 northbound at 11am. Surrounding roads were awful come 7.30pm, huge queues on the Blackwall approach (NB), as well as Blackwall Lane and Woolwich road. Let’s hope it’s due to the opening weekend, and not a weekly thing. I live next to Westcombe Park station and walked by IKEA a couple of times on Saturday 9th, first at 4pm, and again at 7pm. Traffic was the worst I’ve ever seen in the area at 4pm. Even at 7pm there were still car park marshalls directing cars around the car park to spaces because there were just so many cars trying to get in and out. It’s truly made a bad traffic situation ten times worse.